After a playing career on the South African PGA Tour, Mel turned his focus to teaching under the tutelage of Phil Ritson back in the 70’s. 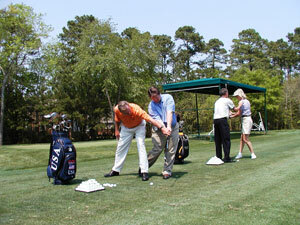 Phil had been coach to Mel and several other Pros, including the renown Gary Player, who were playing the SA PGA Tour. Mel found the teaching side of golf to be hugely rewarding, and his coaching of Junior Golf Teams in South Africa produced 2 National Champions and several Junior Champions. Asked to name the most significant influences on my teaching career, I credit world-renown instructor Phil Ritson as the biggest influence. Phil was my coach when I played the South African PGA Tour in the 1970’s. Although Phil coached Gary Player and other Tour Players, he also worked with hundreds of amateur and junior golfers. His simple and easy-to-understand manner got fabulous results from all skill levels, and I became intrigued by his talent and by the process of teaching. He uses very innovative approaches, possesses outstanding communication skills, and displays a quick wit which is great for golf. I was fortunate to apprentice under him and thank him to this day for sharing his vast knowledge and his love of teaching golf with me. Sports Psychologist Dr. Carey Mumford has influenced my teaching also. I thank Dr. Mumford for helping me to understand the mental side of the game more clearly. He illustrated the differences in learning styles and showed me ways to better communicate with the variety of personalities I face with my students. Dr. Paul Schempp impressed upon me in his ‘Performance Matters’ sports seminars the effect of recognizing and focusing primarily on the core problem in a golfer’s swing. Dr Schempp showed myself and other instructors that in fixing the root cause of a problem, a lot of other things fix themselves as a result. More recently, I have been influenced by Top Teachers Lyn Marriott and Pia Nilsson. Marriott and Nilsson have coached Annika Sorenstam and many other PGA and LPGA stars. Their Golf54 academy is on GOLF Magazine’s “Top 25 USA Golf School” list, and their book/CD called ‘Every Shot Must Have A Purpose’ is one of the best I’ve ever experienced on the teaching of golf. These 2 teachers don’t espouse the theory of hand-holding when working with a student. After some practicing-with-purpose work, they ask the golfer to analyze each shot and to decide what exactly he or she needs to do to produce a better shot the next time. Lyn and Pia showed me how to help my own students to self-correct when they’re on the golf course, and it’s been a great revelation to me. This story may be of interest to some of our newer and lesser-experienced golf instructors. Early in my teaching career in South Africa I had a very humbling, yet very successful, teaching experience. A woman approached me and said her husband was to retire in 2 years time and that golf was his passion. She knew that she needed to learn to play golf if they were to spend time together in the future. Peggy came to the course every day of the week (including Sundays) and practiced for several hours – often from 9am to 5pm. I designed a practice regimen that allowed her to do this without getting too tired. A liberal amount of short game work was mixed in with practice on the full swing. We continued with one lesson per week, and in between she diligently practiced the prescribed drills. To cut a long story short, Peggy attained her 36 handicap in 22 months, but did not quit there. Because she was so accustomed to this daily regimen, she continued it and in 5 years she was a 10 handicap player. In the week I left my Head Pro position at the club, Peggy missed winning the Ladies Club Championship by one shot. Needless to say, I have never suggested to anyone since that they can’t play golf!